The term vitamin K encompasses various substances which are derived from the 2-methyl-1.4-naphtoquinone nucleus or menadione and which are involved in activating certain coagulation factors. • Phylloquinone or phytomenadione (vitamin K1) is produced by plants, particularly green leafy vegetables (cruciferous vegetables such as cabbage, parsley, spinach and lettuce). It is fat-soluble, heat-stable but sensitive to light and to alkaline environments. • Menaquinones (vitamin K2) are produced by bacteria in the intestinal tract, but instead of being distributed in blood vessels, bones and various tissues, they are unfortunately completely eliminated from the body in faeces. These K2 vitamins are also found in offal, meat, fermented products such as some cheeses, and in particular natto, a traditional Japanese food made from fermented soya beans, by far far the richest source of vitamin K2 but not part of most Western populations’ daily diet. Vitamin K is so called because of its effect on ‘Koagulation’ (from the German). After being taken up by the lymphatic vessels, it is formed into chylomicrons and accumulates in the liver where it has a role in synthesising four coagulation factors including factor II (prothrombin) and its conversion into thrombin. VItamin K activates the synthesis of osteocalcin, a specific bone tissue hormone produced by osteoblasts. It thus ensures bone mineralisation by capturing and distributing calcium in the body, to bones and teeth. It also helps keep it moving, driving it out of the arteries and soft tissue, which protects the latter from future calcification, such as atherosclerosis and aortic calcification, and supports healthy kidney function by preventing calcium kidney stones. Supplementing with vitamin K can therefore help reduce osteoporosis-related injuries, such as fractures (of the hip, for example), and in particular protects against calcification of the arteries. Vitamin K2 is also one of the most effective preventive agents against chronic inflammation which can gradually and silently damage tissue and thus contribute to the development of closely-related health issues and diseases: obesity, cancer and cardiovascular disease (by reducing strokes and heart attacks). Studies have shown that vitamin K2 combats inflammatory processes by inhibiting pro-inflammatory markers produced by monocytes. According to a recent Spanish study involving more than 7000 participants over a period of approximately 4.8 years, individuals who increased their vitamin K consumption (phylloquinone and menaquinone) had a lower risk of cancer and all-cause mortality than those whose intake fell or remained unchanged. Researchers concluded that an increase in daily vitamin K intake is associated with a lower risk of cardiovascular disease, cancer and all-cause mortality in a Mediterranean population at higher risk of cardiovascular disease. A one-year Japanese study of women over 65 with Parkinson’s disease found that supplementing with vitamin K at 45mcg a day reduced the incidence of hip fracture and slightly increased bone density compared with a placebo group. A more recent study has shown that vitamin K2 may even have a preventive effect against Parkinson’s because it acts as an electron transporter, maintaining normal ATP levels in the mitochondria. Of the menaquinones that make up vitamin K2, menaquinone-7 or MK-7 extracted from natto, is the fraction with the highest bioavailability and activity. Menaquinone-7 has been used in Japan since 1995 to protect and strengthen bones and joints. • a protein which prevents calcium from being deposited on blood vessel walls, thus supporting cardiovascular health. 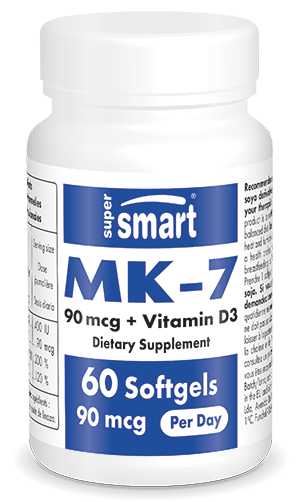 Who might benefit from supplementation with MK-7 + D3? Such is the potential of vitamin K2’s health benefits, that like vitamin D3, it can be considered as one of the major nutritional supplements of recent years. The addition of vitamin D3 to this complex facilitates the absorption and transport of calcium in the bone system. It significantly boosts the effect of menaquinone-7 by improving bone formation and bone mineral density in menopausal women whether or not they have osteoporosis. These two substances therefore act synergistically. In addition, recent studies have shown that vitamin D3 helps maintain and support pancreatic insulin activity and carbohydrate metabolism and that it provides effective support for immune function. • those at risk from cardiovascular disease and cancer. Scientists at the University of Maastricht demonstrated recently that even many healthy people are deficient in vitamin K and that supplementing with vitamin K2 may be beneficial for those aged over 40. 90mcg of MK-7 a day, equivalent to 15g of natto, has been established as a beneficial daily dose, to be taken with a meal containing other fats for better absorption, even though the softgels are already composed of linseed oil, recognised for its high content in alpha-linolenic acid, an essential fatty acid and the top omega-3. Vitamin K2 itself is non-toxic. However, given its effectiveness as a coagulant, it is advisable to consult a health professional before taking it alongside anti-coagulants (coumarin, heparin...). Caution : At doses above 2000 IU a day, a 25-hydroxy vitamin D test is recommended. Do not take vitamin D3 unless advised by your therapist if you suffer from kidney disease. Do not exceed 10,000 IU a day, all sources combined, without checking with your therapist. Consult your therapist if you are taking anticoagulant medication. Contains soya derivatives.